Asia-Indonesia-Yogyakarta This Monument is right in the centre of Yogyakarta. It is a great base to explore the surrounding areas and the World Heritage Sites. Purchased this stamp at the Post office in the city . 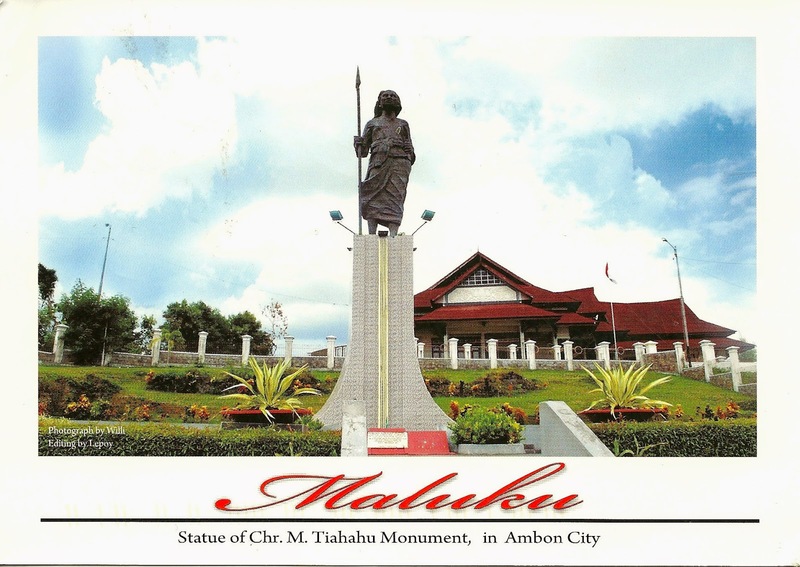 Asia-Maluku-Ambon-Kota Ambon Not that easy to get to and also known as the Spice Islands. I had hoped to get to the Banda Islands but the schedule did not work out. These Islands have beautiful Mountains and great scenery. Unfortunately here there had been religious conflict and many of the Churches were partly burned or damaged. Posted in Ambon City where I stayed. A large efficient Post office . Asia-Indonesia-Borobudur On the Island of Java . One of the very best World Heritage Sites I have ever visited. Really breathtaking when you see Borobudur for the first time. Spent many hours here enjoying this wonderful site. 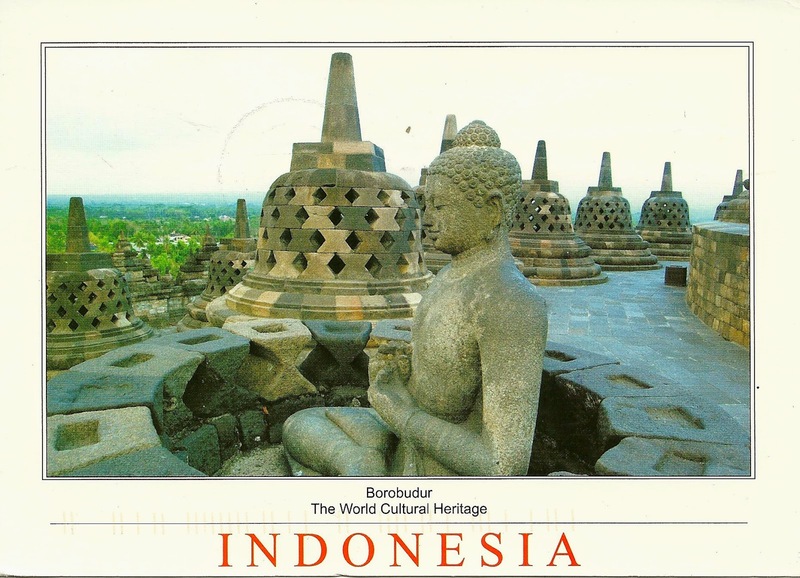 Went to the local Post office and as such a Borobudur postmark. I have been informed that there is in fact different rates in Indonesia for posting, depending on where you are sending from. I wonder does this happen in any other country? 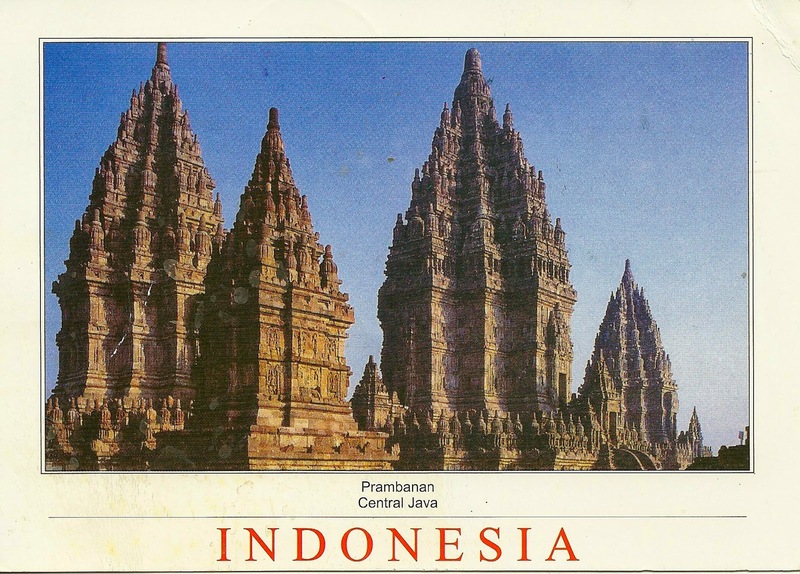 Asia-Indonesia-Prambanan Another gem of a place and a World Heritage Site to visit. You can see why this part of Java has so much to see. Indonesia is also very cheap compared to other countries to visit in relation to day to day costs. A very vibrant country. I think I posted this in the main Post office in the nearest city. 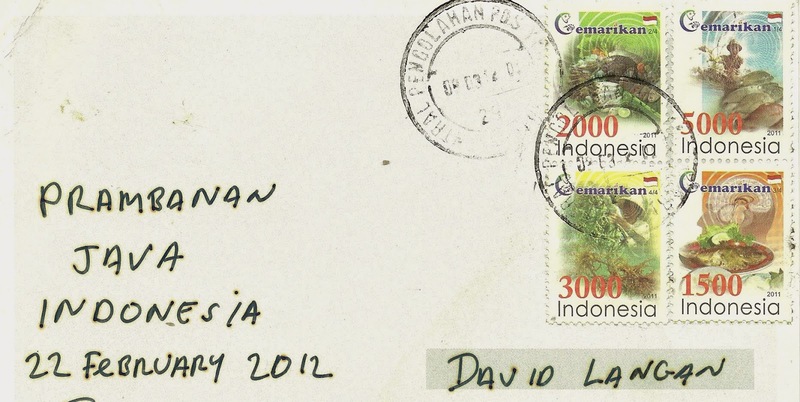 I had brought most of the stamps with me from the Philatelic section in Jakarta. Asia-Sumatra-Bukit Lawang A fantastic first stop after Jakarta. Had a wonderful time up here staying at a lodge in the rain forest. The day we spend looking for the Orangutan's was very special. 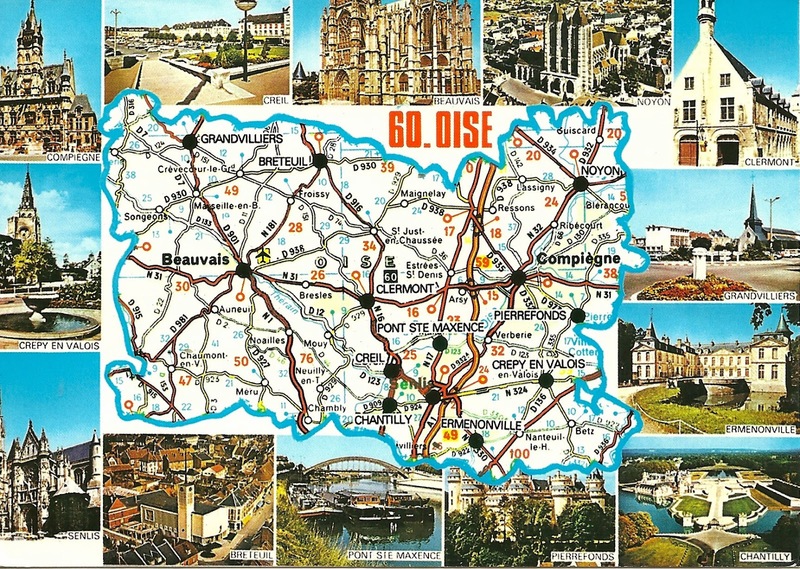 I have many photos and all as close as the one in this postcard. Even the nearby village was lovely to walk through in the evenings. 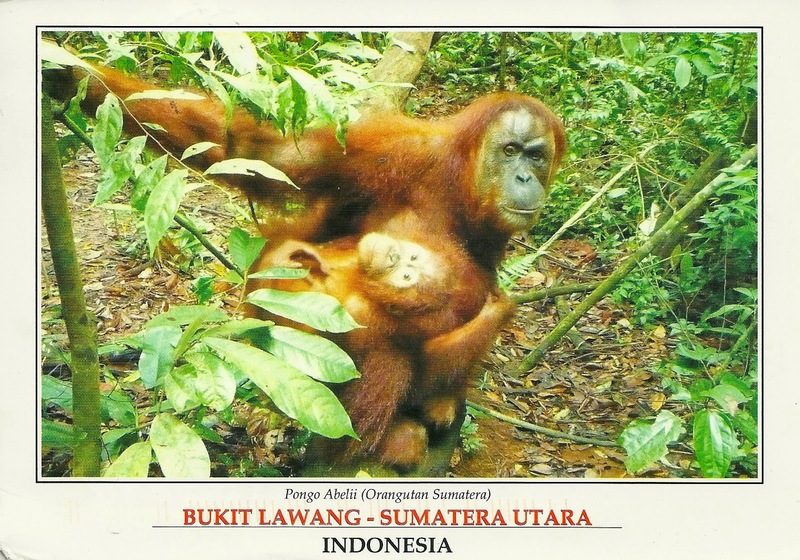 This area of Indonesia is also a World Heritage Site. There was no Post office, but there were a few postbox in the local village. Asia-Kalimantan-Banjarmasin This city is right on the river in Kalamantan the Indonesian side of Borneo. I had been to the Malaysian side which to be honest has much more to offer in my opinion. 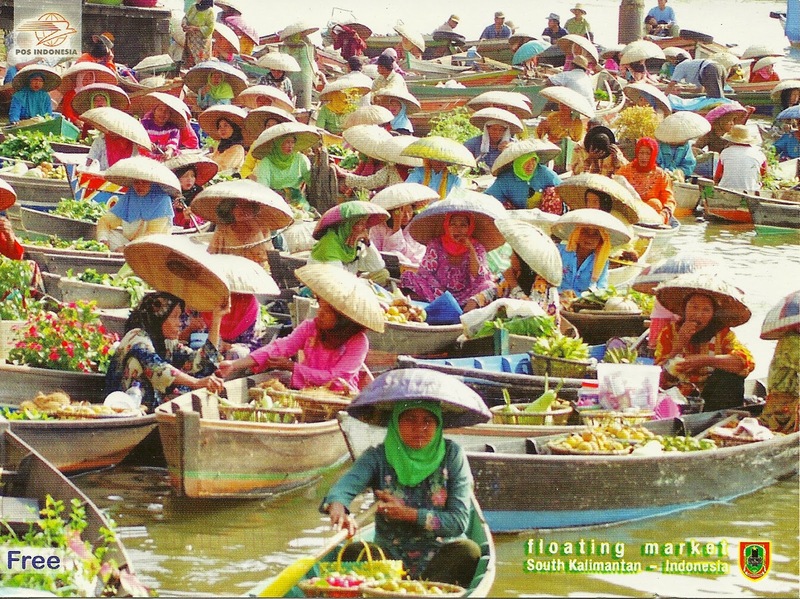 The highlight in Banjarmasin was the visit the floating market early in the morning. Very colourful and lots to see . This trip you are on a small boat along with the sellers. so very enjoyable. 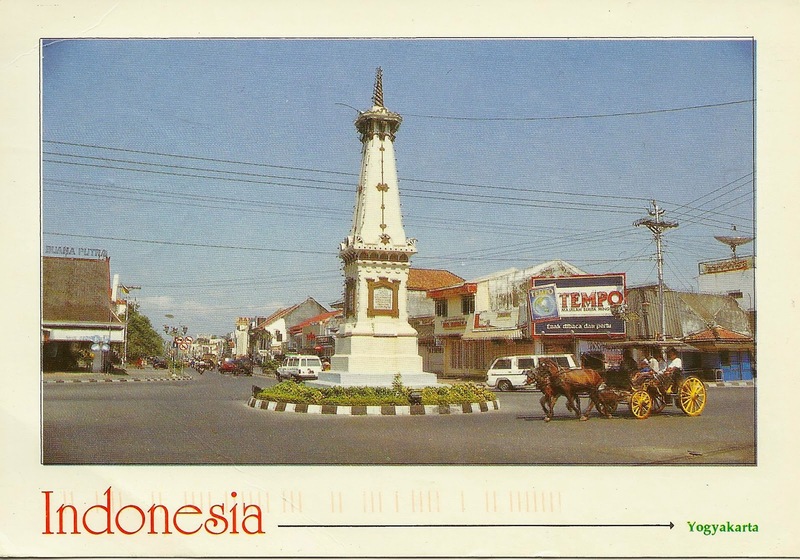 I could not find a postcard in Banjarmasin. Luckily the Post office had this free postcards to give out. 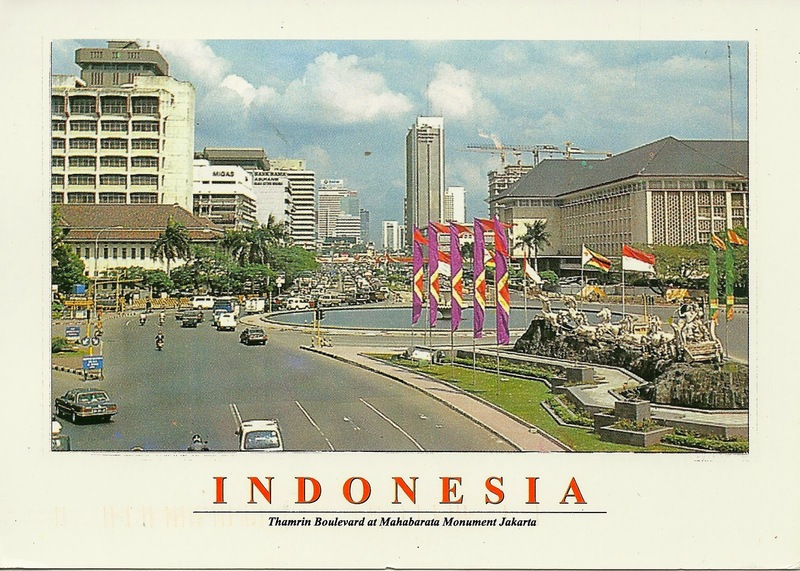 In Indonesia I must have got at least 3 different rates for mailing Postcards from here. I never did find out the correct rate! 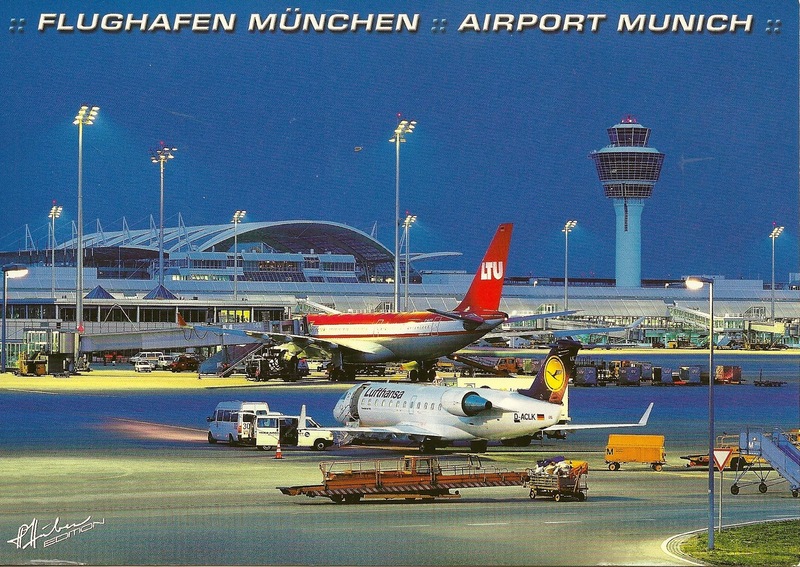 Europe-Germany-Munich My first time to use this airport as a connection . Very good and easy airport to get around. There is a Post office at the airport. Asia-Indonesia-Jakarta The Capital of Indonesia I had passed through here before but never stayed . So spend a few days here seeing this city. Lots to see and bigger then I had anticipated. Great visit to the large Post office here. Very well organised and a separate Philatelic section. Lots of stamps to choose from. Europe-France-Beauvais Catching a Ryanair flight back to Dublin. Beauvais is the low lost airport . French stamps are so nice. Here is a one printed in recess. 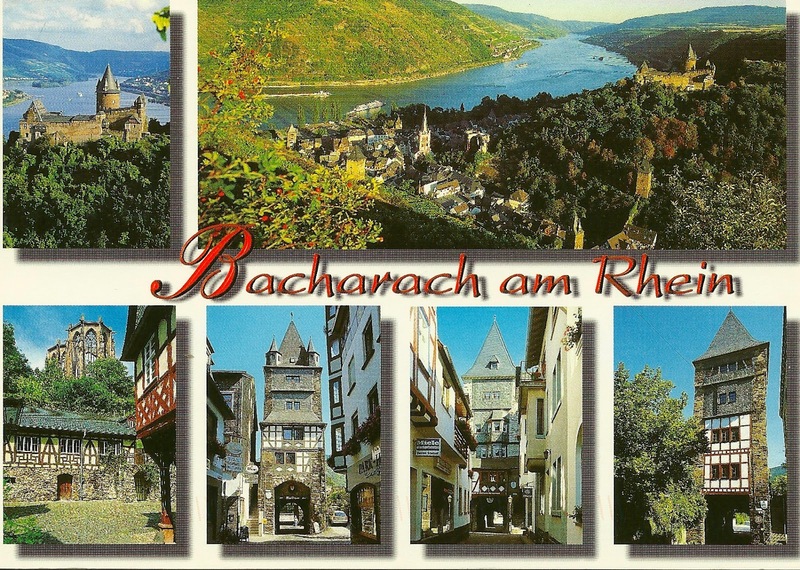 Europe-Germany-Bacharach On the Rhein a very nice village. Enjoyed the look and the feel of this old village. This area is a World Heritage Site. In these small towns the Post office and the shop is one and the same. 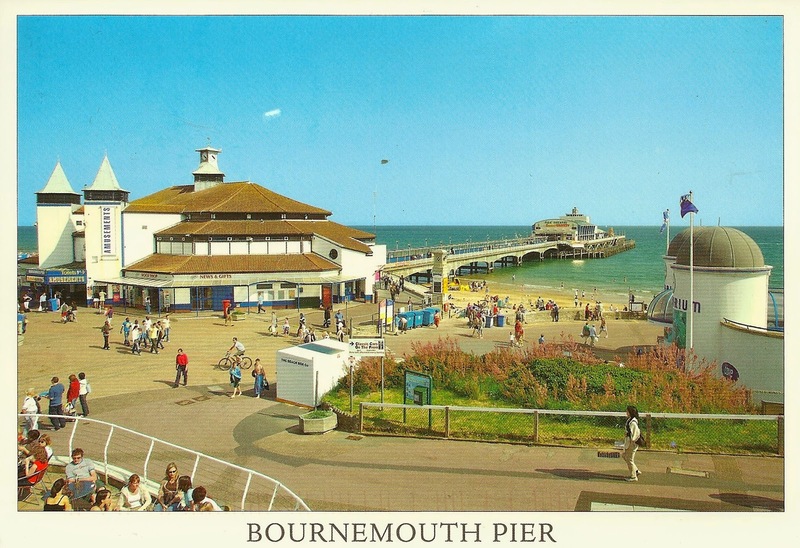 Europe-United Kingdom-Bournemouth In the South of England. Went to visit some friends. A typical English seaside town with a large proportion of retirees. Europe-France-Nancy What a wonderful place this is. 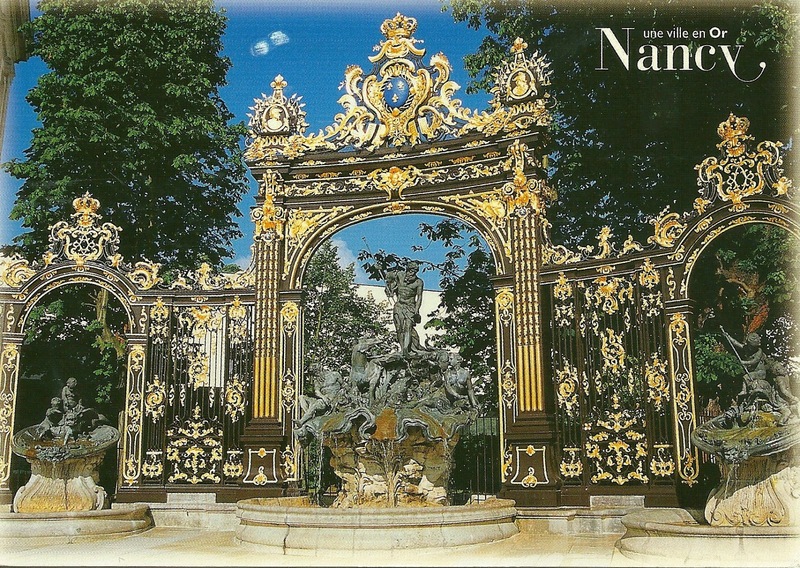 The gates on the Postcard are a brilliant sight in Gold. A Well deserved World Heritage Site. Nice to have a circular stamp , which is now more common in use . 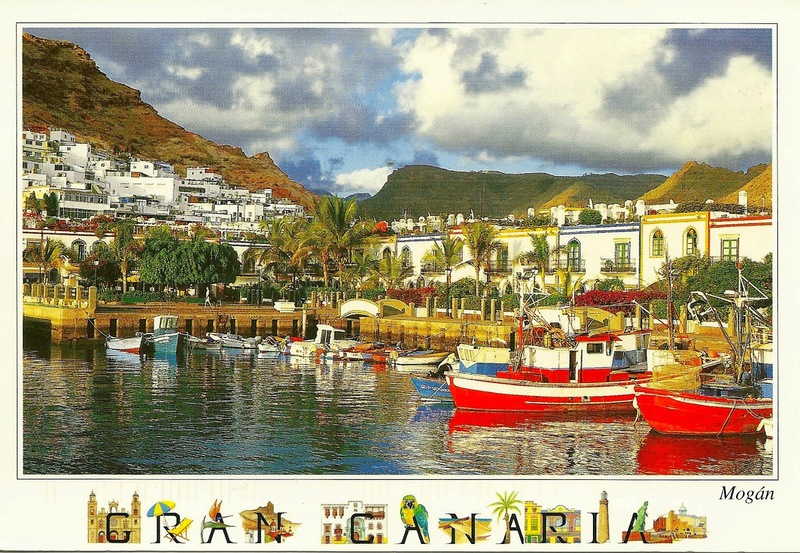 Atlantic Ocean-Canary Islands-Gran Canaria-Puerto de Mogan This is a little sea side fishing village in Gran Canaria. Very nice to visit and have lunch . This is the view from a restaurant. Ireland do not issue many joint stamp issues. Here is the one issued with Spain. Featuring Dancing and in this case Irish Dancing ie Riverdance type . 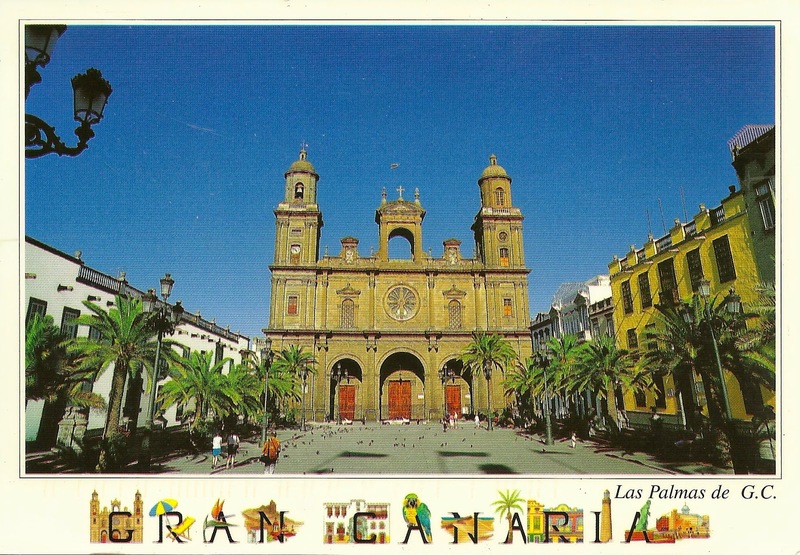 Atlantic Ocean-Canary Islands-Gran Canaria-Las Palmas This is the capital of Gran Canaria. This is the famous Cathedral in the city. Here is the Spanish stamp in the joint issue with Ireland. Dancing and in this case Flamenco Dancing. Don't see so much now but did a lot on my early trip to Spain with the family. Atlantic Ocean-Canary Islands-Gran Canaria-Playa del Ingles When I was a lot younger visited Gran Canaria many times. But stayed in Puerto Rico . This time in Play del Ingles. It really is just about relaxing with friends and doing nothing. Not my usual type of trip, but still good not to concern oneself with seeing the sights. I have to say I really like these stamps. Spanish Post offices tend to have limited stamps unless you go to a Philatelic head office. 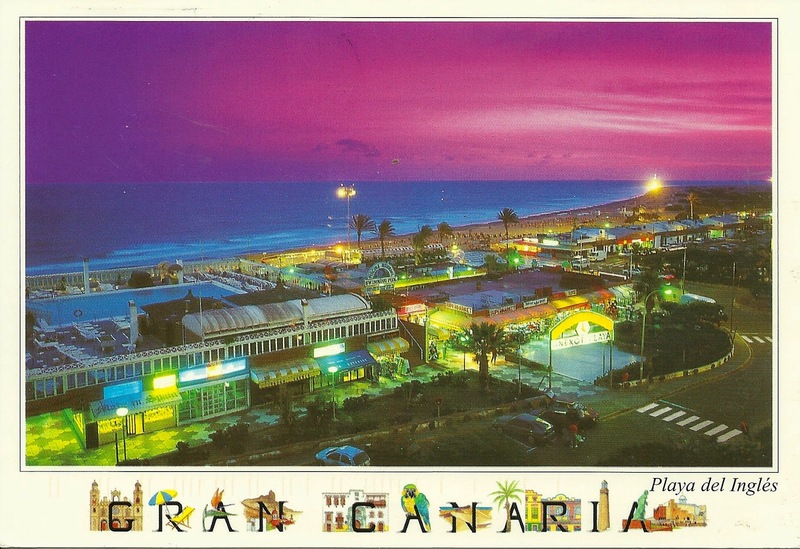 Atlantic Ocean-Canary Islands-Gran Canaria-Playa del Ingles Hotel Postcards are sort of gone out of fashion, so delighted to see one of my hotel . 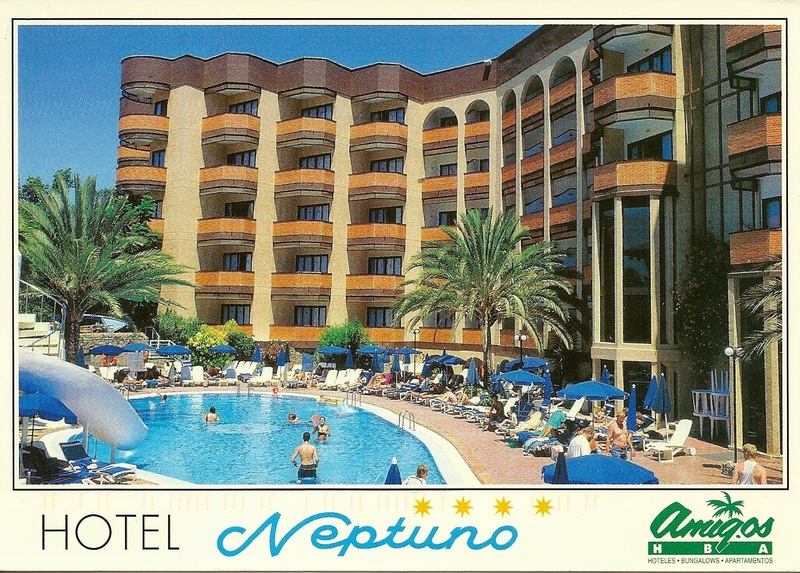 The key here is to get up early in the morning to get one of the sun loungers if you plan to sit by the pool. At least you get clear cancellation here. Europe-Ireland-Dublin This is Dail Eireann , or the Parliament in Ireland. My first and only visit was in 2011. They had a open day and if you booked far enough in advance you could get a ticket. So I did and hence the postcard. 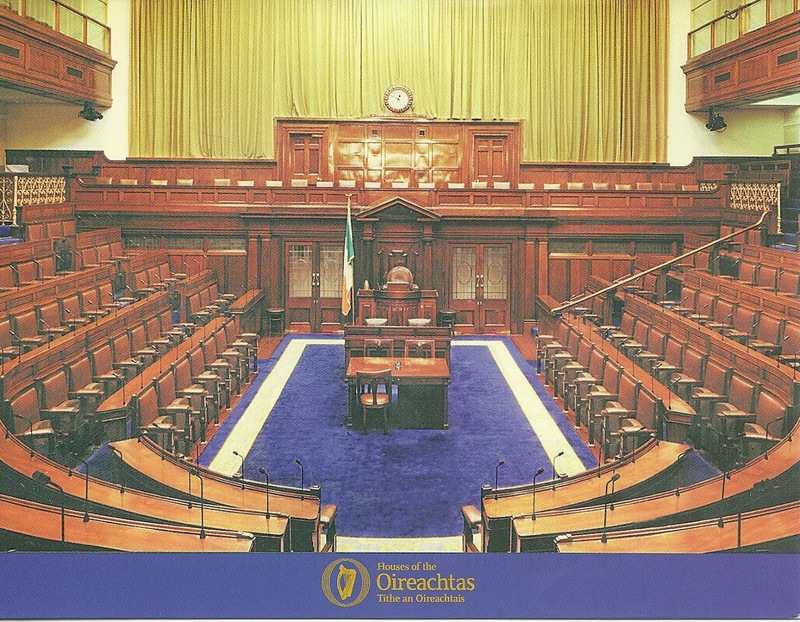 Dail Eireann is centrally located here in Dublin. This stamp is from a booklet , featuring arts and crafts. 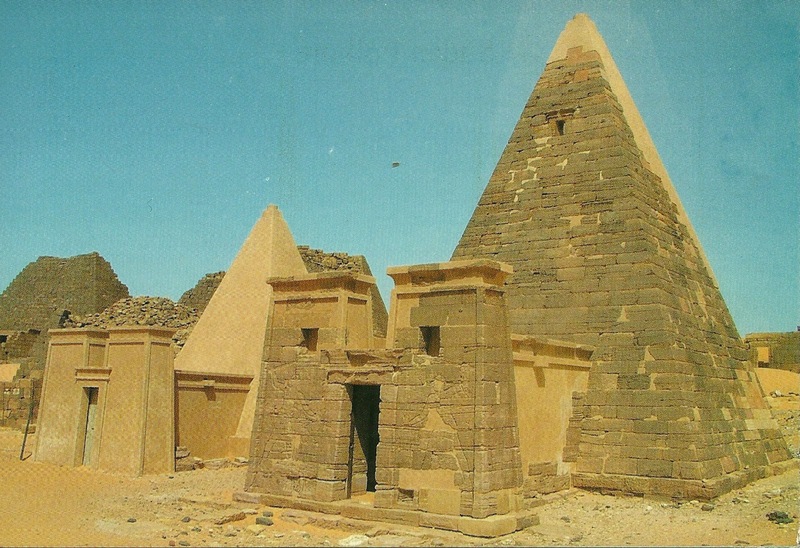 Africa-Sudan-Meroe This is one of the key sights in Sudan to visit. Once part of Upper Egypt . The Pyramids are a lot smaller than the ones in Giza in Egypt. A great drive to get out to see some of the desert. At times there was no road so was amazed the driver knew where he was going. Very hot and surprise surprise I was the only tourist there ! This area is part of a World Heritage Site. At the nearby filling station the last thing I expected to find was a Post office. It was new but looked underused. Still happy to find it and some more different stamps too. Had a weekend in Rome . A city that one can visit 3 different Post offices. First up is Vatican Post. I had been to the main Post office near St. Peter's Square but this one is at the end of the Sistine Chapel as one exits. I found out that Vatican Post has 4 Post offices. The Post offices themselves have a limited selection of stamps. You have to go to the Philatelic section on the other side of the square. On this trip I did visit the Vatican Museum as well for the first time. Very impressive and well worth while buying the ticket in advance to miss the large line outside. This is my second visit to The Sovereign Order of Malta. They had just opened a new visitors centre in April. This building has diplomatic status. Here I am in the visitors centre with lady who is in charge . Behind you see a photo of the Grand Master. Upstairs on the second floor is the Philatelic and Post office. Unfortunately there is only a select countries in the world who have postal arrangements with the Order of Malta. Ireland is not one of them. So only limited countries I can mail Postcards to. Last time I sent to a friend in Italy and then the postcard was sent on to me. Here is the latest issue and a special Order of Malta postcard being stamped by the chief Postmaster. And finally to Rome itself. What a great city though at times a little chaotic. So much to see so little time, I would say. Had a great time and here is the famous Colosseum . One could spend many months in Italy and still have lots more to see. 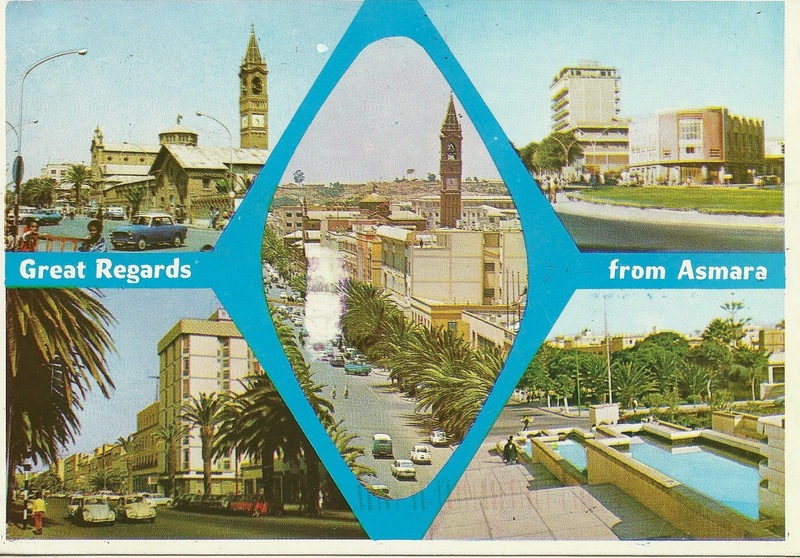 Africa-Eritrea-Asmara A Country that tends to be in the news for all the wrong reasons. Even getting a visa to get here took quite a bit of patience and 6 weeks waiting for approval. However I have to say that Asmara is one of the most beautiful cities in Africa. It had not been damaged by war unlike many of these type of cities in Africa. Asmara has the most wonderful Art Deco buildings from the time the Italians were here. A true gem of the city and real Italian food. However underlying all that was my first impression of no police or army to be seen. But I soon worked it out that in fact that a large proportion of men who were standing or watching were in fact officials of the State. It was most noticeable when I went near the area of the Presidential palace to sit on a park bench. I could see a lot of men in well dressed clothes looking at me from different angles. When it got to much for them following me , one approached and told me I could not sit there . In saying that a very friendly and safe city . Could not go out of Asmara due to a permit which takes 3 days to acquire. Still fond memories of this city and all the 1930s buildings. Like straight out of a movie set! The Post office was a large impressive building right down town. They even had a full philatelic shop with all supplies on display. Would put many a Post office to shame. So full marks here. 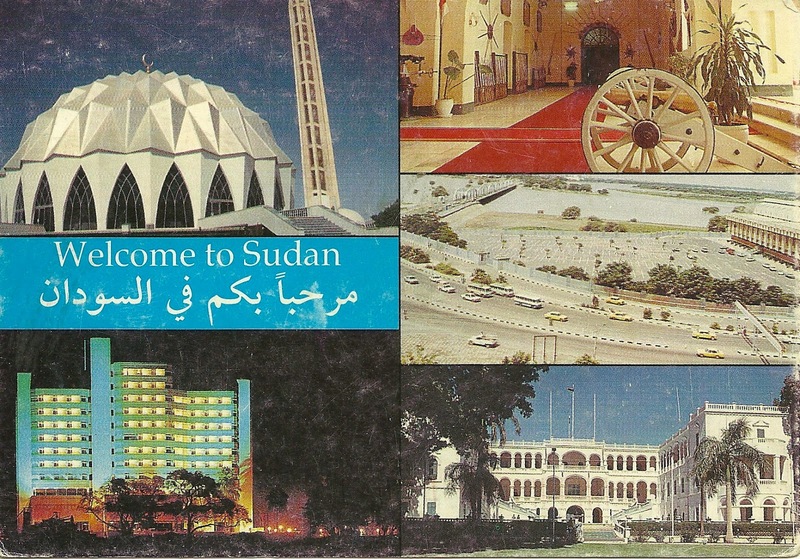 Africa-Sudan-Khartoum Sudan was another county one had to go to the loops to get a visa. In this case I had to fly to London to have a interview in advance in the embassy. The consul official was very friendly and kept asking me about Dublin and the weather. He had one look at my passport and said "Ok visa no problem". He asked me why I wanted to visit Sudan and I told him the Pyramids. His face light up when he heard I had done my homework on Sudan. At the end I asked him why the questions on Dublin,. He told me it was his favourite city and he was going in the morning and wanted to know if it was likely to rain !!! Karthoum is in fact at least two cities and large at that. You know you are in the "Sandy " part of Africa with sand everywhere. The city was very hot and busy. Here on the top right you see the Presedintal Palace which one often passes by in the taxi going around town, but one must be careful not to take a photo or hope the car does not break down there. I did have lunch in the famous designed hotel known as the "Gadaffi " Hotel . He gave it as a gift to Sudan. Sort of oval shape. Khartoum must have one of the largest Post offices I have ever been to. Ho Chi Minh is also large and beautiful. But inside this Post office one win no awards. Mail is pilled up in bags for months just sitting there. It is so unclean and very little electricity to see anything. There was only one counter open and no choice in stamps. I did try to send some postcards to the USA but was told due to sanctions not possible to send mail there . I did not know if this card would ever make it home as a friend of mind did some work in Sudan and sent me postcards but I never got any. 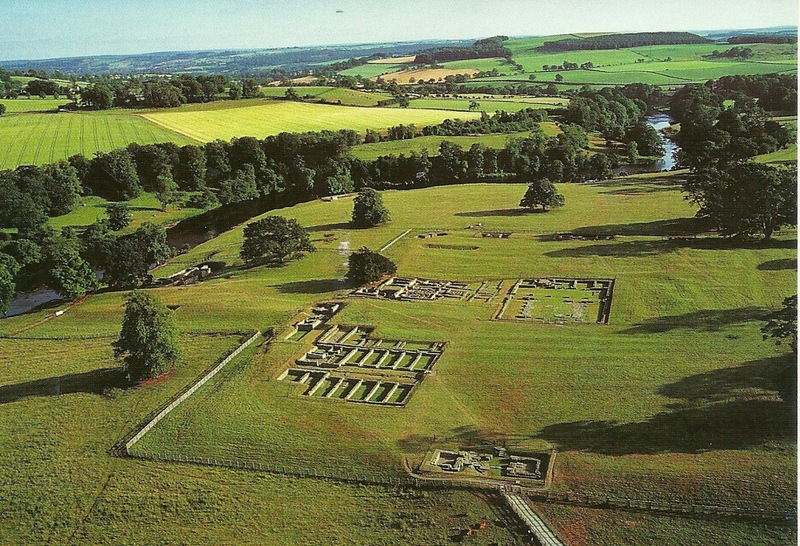 Well it did..
Europe-United Kingdom-England This is Chesters Roman Fort built astride Hadrian's Wall. A very enjoyable day out in the North of England . I could only buy stamps in the shops at Chesters Fort, so only got standard airmail stamps. Europe-United Kingdom-England This is Housesteads Roman Fort . This lies on the best known part of Hadrian's Wall. 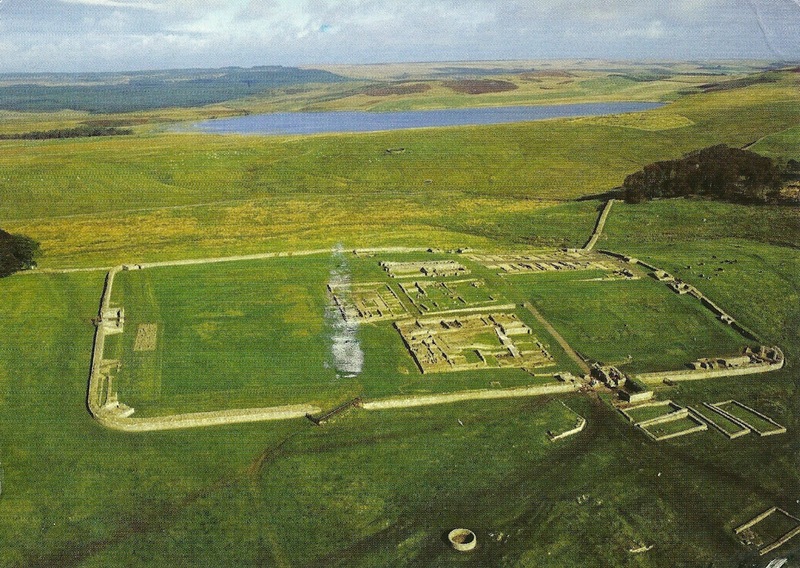 This view shows the fort, the most complete example in Britain with part of the civilian settlement in the foreground. This card has little or no postmark, but it was a memorable part of my visit so the card stays in my collection. North America-United States of America-Miami This was the cruise ship I did that trip on that has been uploaded featuring the Caribbean. 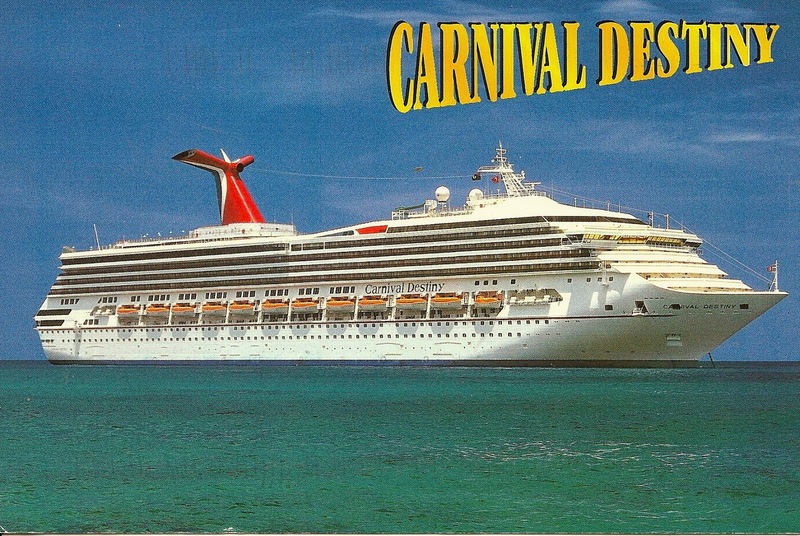 I have been on a good few Carnival Ships, I would say they at the Value end of the market. Still it got me to where I wanted to go and the bedrooms are larger then most. Despite what the card says, the end stop was in fact Miami. I got confused as I had started in Fort Lauderdale , but the ship sailed from Miami. Great set of stamps here. . Normally I don't put this here, but moved over to Mac from a PC this week. So it takes a bit of time sorting all out. But getting there. A least I am now also getting all my photos in order so when I get to the stage of uplifting those, they should be in some order. .